Data drives business and the development of AI. Tencent's most important strategic vision was to identify health care as the greatest source of such data both for the sake of improved outcomes - and that can be repurposed to drive other commercial results. Tencent hosts 55% of China’s mobile internet usage. (It) is China’s biggest social network company with 1 billion users on its app WeChat and 632 million monthly user accounts on social platform Qzone. (It) is worth more than Facebook. Of Chinese tech firms, Tencent (did) the greatest number of AI equity deals and made the most AI investments in the US. Tencent would like to be a world leader in personalized medicine using AI. 38,000 medical institutions have a WeChat account and 60% of those allow patients to book appointments online. 2,000 hospitals accept WeChat payment. Healthcare AI is a main priority for Tencent, based on the company’s investments and AI partnerships. China would like to be a world leader in personalized medicine using AI. More than 38,000 medical institutions have a WeChat account and 60% of those institutions allow patients to book appointments online. Additionally, there are 2,000 hospitals that accept WeChat payment. These services allow Tencent to collect valuable consumer data that helps train AI algorithms. In a recent partnership with Babylon Health, WeChat users will have access to a virtual healthcare assistant. 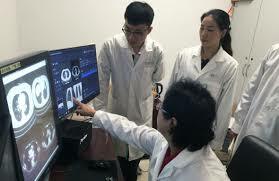 Pushing the envelope even further, Tencent invested in iCarbonX, a company that aims to develop a digital representation of individuals to help perfect personalized medicine.